The Wonder Years meets Underbelly in this exhilarating, hilarious and heartbreaking novel that blasts readers back to 1980s suburban Brisbane. Young Eli Bell has a few things to deal with. He's estranged from his drunkard dad, who left the family long ago. He lives with his mother, the often off-her-chops Frances, and his stepfather Lyle, who brings home the bacon thanks to his job as a heroin dealer. When neither of them are around, Eli is cared for by Slim, a notorious crim who served time for murder. Eli considers all of this to be perfectly fine, but things are about to get worse: Frances gets shunted off to jail and Eli and his mute older brother are obliged to reacquaint themselves with their father. Given this is a coming-of-age novel, Eli of course plans ways to improve his lot – including breaking his mum out of jail. Things segue from dodgy to fair dinkum dire for the adorable young narrator as he embarks on an epic personal journey, stealing the hearts of readers along the way. The stakes are pushed higher and the plot goes from twisty to downright knotty. This book has many hallmarks of a good thriller and is multi-layered. In essence, it's a tale of love, family, friendship, dreams and forgiveness, delivered with tangy side orders of wit, charm and misery. Award-winning journalist and novelist Trent Dalton drew on his own childhood for this hefty 471-page tale. When he was a small boy, his mum fell on hard times and he and his brothers were sent to live with their father in the outer suburbs of Brisbane. It may have taken a few decades, but the alchemical process of distilling real life into art has resulted in a cracker. Simply fill out the form below to be in to win! Entry is open only to New Zealand residents. Employees of Bauer Media Group (LP) NZ or Fourth Estate, their affiliates, agencies and immediate families are ineligible to enter. No responsibility is taken for lost, misdirected or incomplete entries. Entries are limited to one per person. Open to New Zealand residents only. This promotion commences 13 August 2018 and ends 30 September 2018. By registering their details, entrants give permission for Bauer Media Group (LP) NZ to post, email and mobile text message updates. 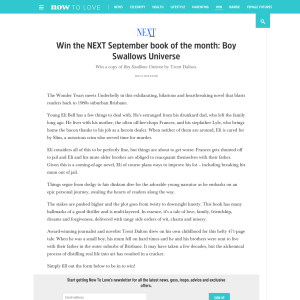 The prize consists of one copy of Boy Swallows Universe by Trent Dalton. We have five to give away. The prize package must be taken as offered and is not exchangeable, transferable or redeemable for cash. Bauer Media Group (LP) NZ reserves the right to exchange any item with another item of greater value. Anything not specified in these terms and conditions as being included in the prize package is excluded. The winner will be contacted via email between October 1 and October 5. The promoter is Bauer Media Group (LP) NZ, Shed 12, City Works Depot, 90 Wellesley Street West, Auckland.